In February, the great city of Paris shows signs of a subtle thaw-- if more of a figurative than a literal one. It's well known that Parisians detest the winter months with a kind of drama that only they could manage. But they also love romance (or so the stereotypes go, anyway). February is the perfect antidote to the end-of-winter gloom and doom, with events such as Valentine's Day giving locals and visitors alike a perfect excuse for fabulous dinners, dancing, strolling, and-- not to be neglected-- chocolate. With so many romantic things to do in Paris on or around Valentine's Day, the city can really be a festive and warm time despite chilly conditions. The weather is generally quite cold at this time of year, with windchill making conditions feel even more bracing. While warm spells have been increasingly common in recent years, you should prepare for the following conditions. 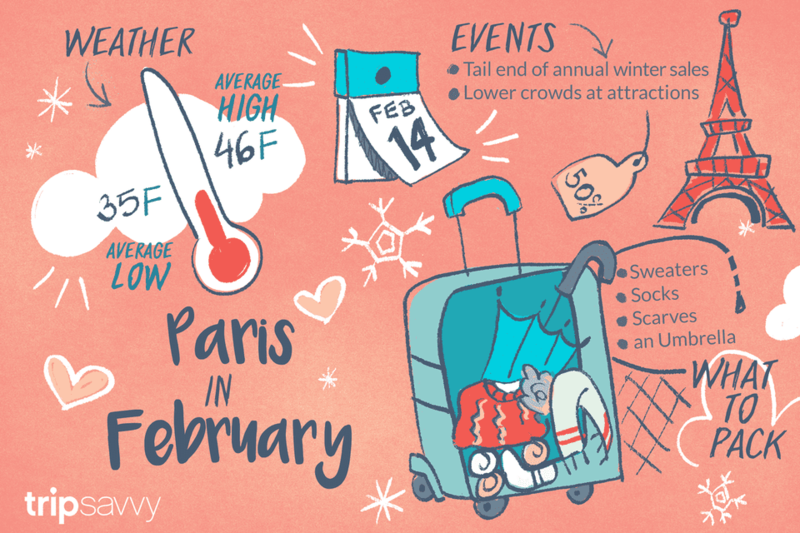 February in Paris is usually chilly or briskly cold, and temperatures sometimes stubbornly linger at frozen or even below. Sudden showers and brief spells of slushy snow are not uncommon. It's essential that you stock your suitcase with plenty of warm sweaters and socks, coats, and scarves, as well as a hat that will protect your ears. Although heavy rains are less common in February, the city is well-known for its erratic and sudden downpours. So packing an umbrella that can withstand a wet, gusty day is definitely a must. Make sure to pack a good pair of waterproof shoes. Shoes with good tread are important because the streets can be slick and icy in February. When there is snow, it tends to melt when it hits the ground, creating an annoying slush. Avoid high heels and dress shoes when walking around the city in February. Bring a pair of good gloves to make sure you don't let cold hands distract you from the sights. Think about packing plenty of books and magazines in case you decide to spend a morning or afternoon reading and contemplating in a cafe. There's little more pleasant than hiding behind steamed-up windows while nursing a hot drink and observing the city from a cozy vantage point. Celebrate Chinese New Year. Bringing the city back to vibrant, colorful life after a long winter, Chinese New Year is a festive occasion in the capital. Witness processions of vibrant dragons and dancers bringing the streets of south Paris alive, taste authentic noodles and dumplings in Chinese eateries and take in colorful red lanterns adorning the streetlamps. Enjoy a romantic getaway for Valentine's Day. We'd be remiss if we didn't mention that a February break to the French capital can afford a fantastic opportunity for a romantic Valentine's Day getaway. Some hotels and attractions offer deals for the holiday, too, so do a little research ahead of time to lock in on some good deals and ultra-romantic activities to enjoy together. Enjoy Quieter Moments at Top Attractions. Because tourism is in a low ebb compared to the spring or summer, visiting in February also provides great opportunities for getting a closer look at some of Paris' most-beloved attractions, such as Notre Dame Cathedral or the Eiffel Tower. You'll finally be able to take as much time as you want to contemplate your favorite monuments or art collections. Snag deep discounts at the end of the winter sales. Let's not forget about opportunities for bargain-shopping and deep discounts. February marks the frenzied tail-end of the city's annual winter sales: a perfect time to take advantage of the city's best-loved shopping districts. Laze around and people-watch from cozy places. Finally, chilly February provides ample opportunities to laze, read, and people watch in the city's many charming cafes, so be sure to pack plenty of books and magazines for your trip. For those interested in Paris intellectual history, cafe-hopping in the city's historical Latin Quarter or in Saint-Germain-des-Près would be a great way to spend part of a day. Take advantage of low-season fares. ? It's right in the middle of the low season, so provided you plan well ahead and book several months in advance, you should be able to get a good deal on flights and trains in February. Make sure certain attractions are open. Since tourism is far from its height at this time of year, some attractions and sites close down. Always check official websites for low-season hours and opening times to avoid disappointment. Visiting Paris in the Spring: How to Make the Most of It?